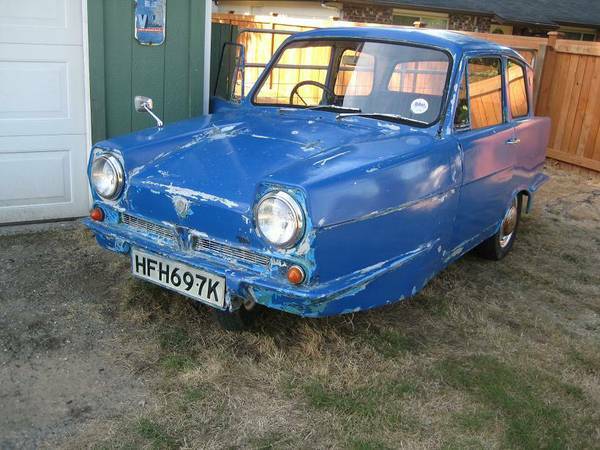 This is a vehicle that brings in many firsts for us – first three-wheeler, first Reliant, first fiberglass sedan. It’s not the most popular car for its driving experience, though it’s certainly achieved a level of infamy for its odd looks and handling. It’s had a prominent place in a couple of major British comedies, and its younger brother, the Robin, was featured in a Top Gear episode for its tendency to roll on hard turns. And for those who aren’t familiar with these, that’s not body roll – they tip over on their side! 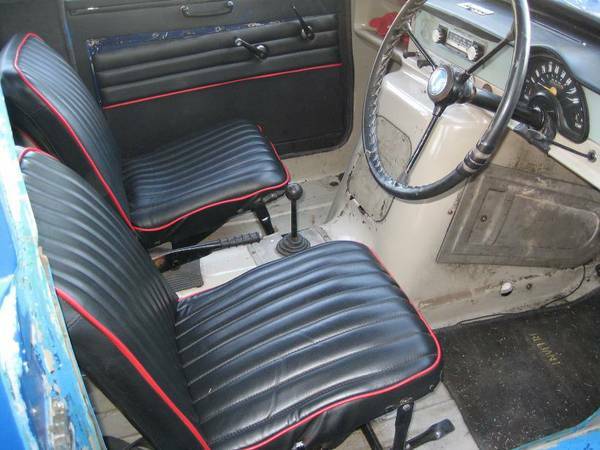 You can find this 1972 Reliant Regal in Ferndale, WA for $3500. Interesting – the seller says this car qualifies for a motorcycle registration here as well, and it’s got the plate to prove it. To quote him on something else, “Frankly, the thing’s a mess.” It’s interesting to see how much photos can also hide, because the car’s definitely looks like it’s been rubbed down to the primer, but perhaps what you’re really seeing is a mass of stress cracks in the fiberglass. The car is also said to need new tires, and has an overheating problem. 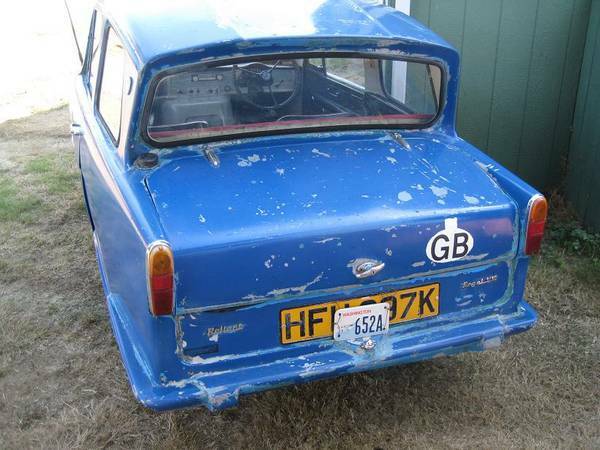 The car shares its reverse-canted rear screen with the Ford Anglia, and indeed shares many styling cues with other British cars of its time. 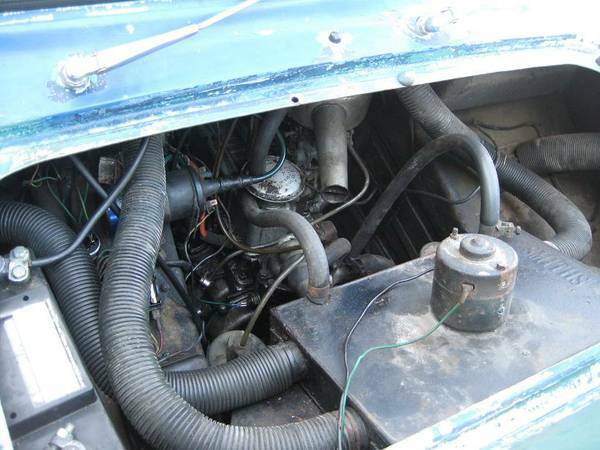 There’s not much to see of the engine – by the underhood layout, Reliant expected the Smiths heater box would need more service than the actual engine. This Regal 3/30, so named for its 3 wheels and 30hp, was powered by a 701cc water-cooled four-cylinder OHV engine. As you can imagine, the car is no rocket, but the lightweight fiberglass body must have helped keep the power-to-weight ratio tolerable. The seller has had the radiator recored, and put in new hoses and a thermostat, but this did not solve the overheating. Next up is a water pump, which the seller has already purchased. He does not mention if he’s tried adjusting the timing. According to the DVLA (British DMV equivalent) this car seems to have last been registered there in 2001, so this car has been here for about 13 years. The interior has been reupholstered, but there are no carpets lining the floors. That points to this being the base model, along with the lack of several other extras, instead of the upgraded 21E (the E stood for “extras”) car. This entry was posted on October 14, 2013 at 5:00 am and is filed under Feature. You can follow any responses to this entry through the RSS 2.0 feed. You can leave a response, or trackback from your own site.